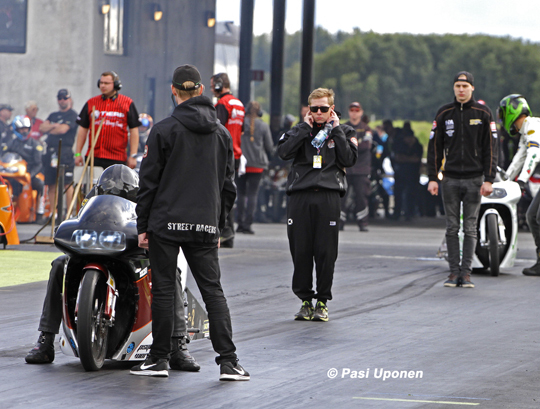 Janne Koskinen from Sweet Cheek Racing will be back in business again at the Summit Racing Equipment Internationals at Tierp Arena in August. And so will also be continued the cooperation with Fredrik Fredlund, the 6-time European Champion in the Pro Stock Motorcycle category. During the 2017 season Janne Koskinen and his mechanics Pyry and Iiro Reinola were helping Fredrik Fredlund at the Dico Internationals in Tierp. And now, Fredlund in turn will give a hand and is going to work as one of the Sweet Cheek Racing mechanics at the EDRS Pro Nordic Motocycle Championship finals in August. Koskinen’s main goal for this season was just to do a lot of testing sessions. But then it turned out that a lot of progress was made. 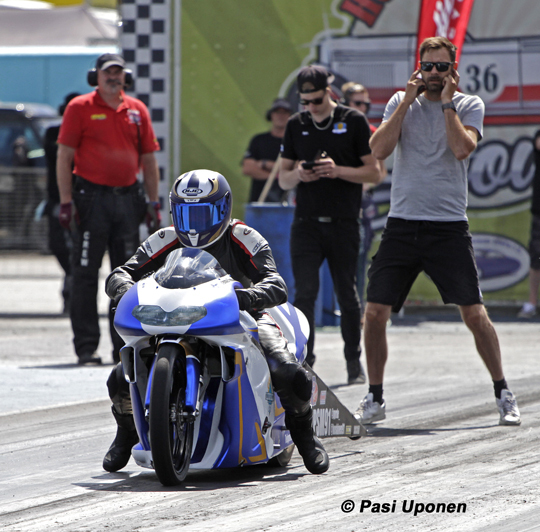 Thanks to the test runs at Alastaro in the middle of June, and Fredlund’s help as well, Koskinen changed his mind, and now he thinks that the team are ready to race at the EDRS Finals. ”We’ve agreed that this year Iiro Reinola would be racing the whole season in the EDRS Pro Nordic MC Super Gas Bike category. 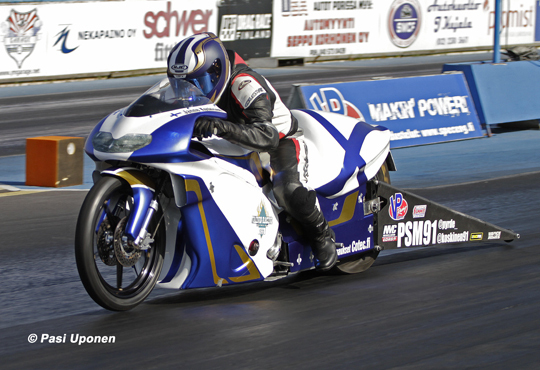 That was the reason why I shouldn’t run more than some test runs only in Pro Stock Motorcycle. We are only with a few guys in our team and it’s quite a challenge to have two bikes running in two different classes on the same day. That’s the reason I didn’t attend the FHRA Nitro Nationals at Alastaro or the Drag Challenge at Gardemoen. But now that Fredlund promised to give us a hand, we’ll certainly manage it, and we’ll have enough hands that both me and Iiro will be able to race at Tierp”, said Janne Koskinen. The testing work is pretty much done now and Koskinen goes to Tierp with a clear goal in his mind: he would like to take a top position, perhaps he could even fight for the win. ”Despite the fact that we’re relatively young as a team, I think we’ve got the potential to have a successful race at Tierp. My personal best of 7.241 seconds at Alastaro is quite high in the list of European results. And we must keep in mind that I’ve done only ten starts in this category. Only five of them were full passes. I’m very confindent with the situation after testing at Alastaro, where I ran 7.2 seconds twice, and a 7.3 and 7.5 seconds. There’s no doubt that with such nice starts and beautiful passes from start to finish line, everything should be possible at Tierp. It’s really encouraging when you make so much progress and the team improve their perfomances, running quickier and quickier,” said Koskinen. ”Our goal at Tierp? To win, of course! In this sport it doesn’t make any sense when you don’t do your best to win. And besides that, you’ll gain experience all the time. You could put it this way, the better you ride, the more starts you have during the elimination days, including that experience as well,” said Iiro Reinola with a smile. 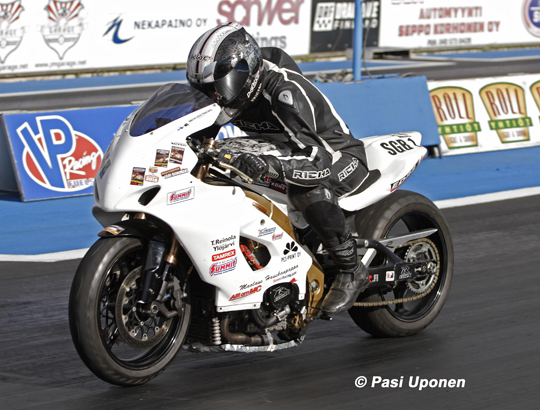 ”Next year we’re going to attend the whole FIM Europe European Drag Bike Championship. When we looked at our goal in the long run, we would like to say it’s the European Championship. It’s the second best title in the world after the NHRA Championship. We would like to run races in the EDRS Pro Nordic Motorcycle Championship as well, as much as we can afford and our schedules permits,” said Janne Koskinen.